Boiron Acidil-Heartburn is a homeopathic combination with natural active ingredients. Warnings: Do not use if blister seal is broken. Ask a doctor before use in children under 12 years of age. Stop using this product and consult a doctor if symptoms persist for more than 7 days or worsen. If you have trouble swallowing or persistent abdominal pain, see your doctor promptly. You may have a serious condition that may need a different treatment. As with any drug, if pregnant or nursing a baby, ask a health professional before use. Notes: Safe, no side effects. 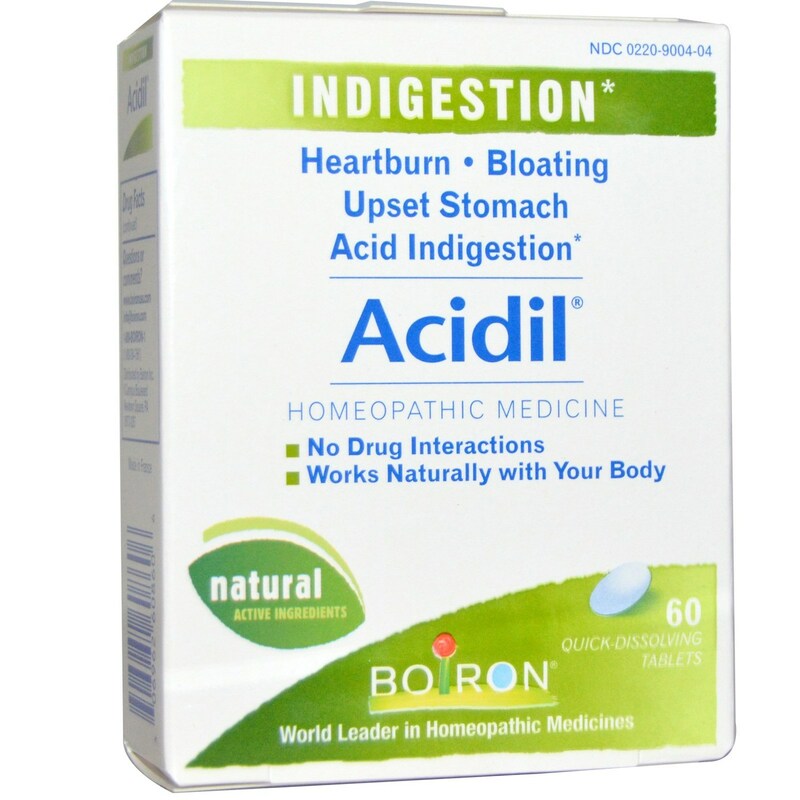 Ingredients: bies nigra 4C HPUS--Relieves stomach pain after eating; Carbo vegetabilis 4C HPUS--Relieves stomach bloating with gas; Nux vomica 4C HPUS (10-9 mg strychine)--Relieves heartburn due to excessive eating and drinking; Robinia pseudoacacia 4C HPUS--Relieves heartburn with acid indigestion. 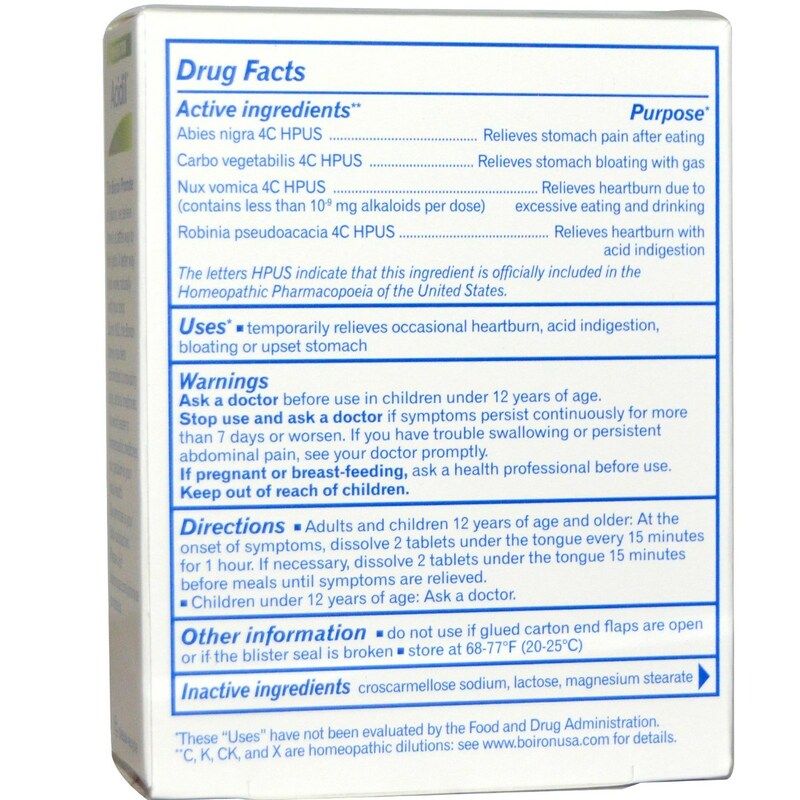 Inactive Ingredients: Lactose, croscarmellose sodium, magnesium stearate The letters HPUS indicate that these ingredients are officially included in the Homeopathic Pharmacopoeia of the United States. Recommended Use: For temporary relief of occasional heartburn, acid indigestion or sour stomach. (Adults and children 12 years of age and older): At the onset of symptoms take 2 tablets and repeat if needed every 15 minutes for 3 more doses. Then if necessary take 2 tablets 15 minutes before meals.